Wear closed-toe shoes. Sounds simple enough, but you'd be surprised at the number of sandal and flip-flop wearers on the trails. Above the ankle hiking boots and socks are even better - a lot of snake bites occur in the ankle area. Snake gaiters that cover from your ankle to your knee are your very best form of snake bite protection. And when hiking, don't just look straight down. Look ahead and to the side before you step. Although reptiles are most active during the months of April through October, during the hottest months they're most active at night. If it's dusk or dark outside, use a flashlight or headlamp to illuminate your path so you don't accidentally step on a snake. If you can't see it, don't stick your hand in it. This just doesn't apply to reaching under wood piles or into rock crevices, it also applies to golf. Don't stick your hand in a bush or a shrub for a wayward golf ball, as these areas are the perfect places for snakes to hang out. You don't want to startle one. Same theory applies if you're hiking or rock climbing or gardening. And remember, rattlesnakes can swim so look twice if you see a floating "stick" in the water! Don't underestimate a baby rattlesnake. There is no such thing as a cute rattlesnake. Baby rattlesnake venom is just as deadly as older snakes, and due to their smaller size, they can be harder to see and thus avoid. Younger rattlesnakes are born without a traditional rattle, so you can't always rely on the noise as a warning. Since rodents are a primary source of food for rattlesnakes, be sure to get rid of any rodents in your yard. Be careful with bird feeders too because those can attract rodents and snakes will be drawn to the smell of birds and rodents. Don't give those baby rattlers fuel for growing up! Practice proper trail etiquette. Experienced hikers know that there is an internationally accepted "triangle" of trail etiquette: Mountain bikers yield to runners, hikers and horses. Runners and hikers yield to horses. Horses are not required to yield to any group. But everyone and everything yields to snakes! Give them a wide berth if you spot one on the trail or even sunning itself on a rock. Don't try to kill or immobilize a snake. Save your pepper spray, too, because that won't work— just back away slowly and avoid a confrontation. If you are close enough to make a direct hit with the pepper spray, you’re close enough to get bit. Not a good place to be. And why aggravate a snake by spraying it anyway? Snakes don’t have eyelids, but they do have a transparent shield that protects their eyes, so the spray won’t really blind them. And while mammals are sensitive to the stuff in pepper spray, reptiles aren’t. Do not handle snakes even if you think they are dead. 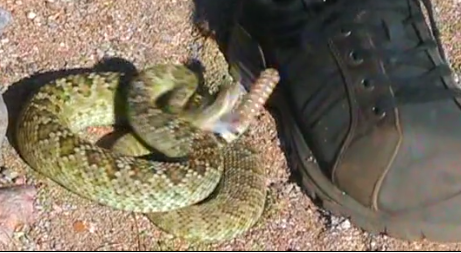 Believe it or not, some rattlesnakes can still strike and inject you with venom when they're dead. This is true even if the snake's head is cut off. Don't take a selfie or reach your hand out to touch it! Snakes are always around, and with nicer weather, snakes and humans are becoming more active in the same environments so the potential for encounters increase. Unfortunately this can mean getting bitten while gardening, pulling weeds around your yard, walking to the mailbox, or hiking with your dog. There's a perception that most people are bit when they've been playing with or bothering a snake, but mostly it's acci dental— being in the wrong place at the wrong time with a snake. Because the number of snake-bite reports increase as temperatures creep up, now is a good time of year to be reminded that being aware of your surroundings is the best thing you can do to stay safe in snake country. And if you frequently have a canine companion or two with you, consider a dog vest that protects them not only from snake bite, but from painful cactus needles, briars, and more. Although you should be aware of the potential for a rattlesnake bite, don't be so worried you don't venture outdoors. Most people don't die as a result of a snake bite, as long as they get medical attention fast. The best thing you can do if bitten is to immobilize the wound and get to the hospital immediately. Most patients are out of the hospital in two days and then spend the next few weeks getting follow-up treatments. A typical person takes about a month to get "back to normal." Being bitten can cause severe injury and long-term complications, but being alert to the dangers of snakes and using snake bite protection can help you avoid them in the first place, and stay safe while in their territory.